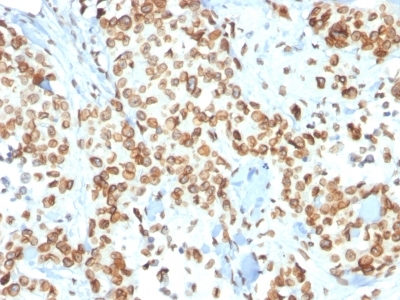 Formalin-fixed, paraffin-embedded human Breast Carcinoma stained with Emerin Mouse Monoclonal Antibody (EMD/2167). Formalin-fixed, paraffin-embedded human Basal Cell Carcinoma stained with Emerin Mouse Monoclonal Antibody (EMD/2167). Formalin-fixed, paraffin-embedded human Renal Cell Carcinoma stained with Emerin Mouse Monoclonal Antibody (EMD/2167). Western Blot Analysis of human HeLa Cell lysate using Emerin Mouse Monoclonal Antibody (EMD/2167). 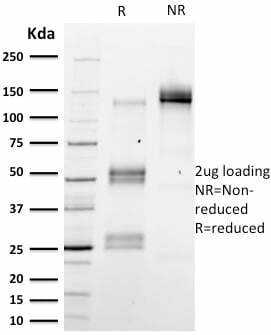 SDS-PAGE Analysis Purified Emerin Mouse Monoclonal Antibody (EMD/2167).Confirmation of Integrity and Purity of Antibody. Analysis of Protein Array containing more than 19, 000 full-length human proteins using Mouse Emerin Monoclonal Antibody (EMD/2167) Z- and S- Score: The Z-score represents the strength of a signal that a monoclonal antibody (MAb) (in combination with a fluorescently-tagged anti-IgG secondary antibody) produces when binding to a particular protein on the HuProtTM array. Z-scores are described in units of standard deviations (SD's) above the mean value of all signals generated on that array. If targets on HuProtTM are arranged in descending order of the Z-score, the S-score is the difference (also in units of SD's) between the Z-score. S-score therefore represents the relative target specificity of a MAb to its intended target. A MAb is considered to specific to its intended target, if the MAb has an S-score of at least 2.5. For example, if a MAb binds to protein X with a Z-score of 43 and to protein Y with a Z-score of 14, then the S-score for the binding of that MAb to protein X is equal to 29.